This coffee table book vividly exhibits the personality of an extraordinary town. Longtime residents lead a fascinating photographic tour of this storied, beloved and irresistible city. Visiting the vibrant cultural life, the rich architectural history, the flourishing art community and its stunning natural beauty, they take the reader into the heart and soul of the Berkeley experience. Not only the book but high-quality prints of all the photographs in the book are available through this website. “Berkeley One and Only … deserve[s] accolades for [its] sensitive, creative, and particularly well illustrated portraits of local life and scenery. “I mean that in a most positive way. Photographer Jon Sullivan clearly loves Berkeley and spent several years documenting not only fixed beauties but ongoing events and ephemeral occasions. “The interwoven themes of the hefty volume range from The Big Game to in-studio portraits of several local artists and their works to Berkeley neighborhoods in the spring. 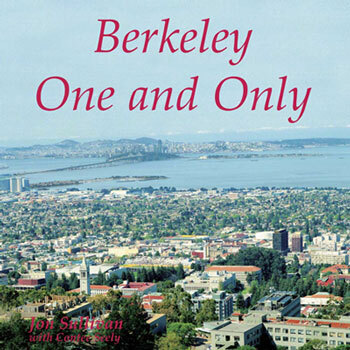 “There’s a chapter devoted to aerial photographs of Berkeley, shot by Sullivan from the open window of a small plane. That section alone makes the book worth getting if you want to peer down on the ever changing local landscape from on high. “A number of Berkeley’s most important architectural edifices and landmarks are fittingly portrayed, but Sullivan also turned his camera on humble homes, one-car garages, cement hoppers, and the innards of complex experimental equipment at Lawrence Berkeley National Laboratory. “Several pages expansively vignette the annual How Berkeley Can You Be? parade, while local murals—including several now vanished—receive their own lavish photo documentation, including no less than four gorgeous pages picturing the monumental and landmark “People’s Bicentennial History of Telegraph Avenue” on Haste above Telegraph. “Berkeley One and Only might be considered primarily a picture book, but short chapter introductions and detailed captions provide a fair amount of commentary and background information. “Neither a panorama of half the city nor a close-up of a picturesque fallen leaf in the UC Botanical Garden escape Sullivan’s camera. “And he has an eye for turning a mundane setting—a stairwell at the Downtown Berkeley BART station for instance, or the fading paint of the “ghost advertisement” on a brick wall—into surprisingly poignant images. “Sullivan is catholic in his portrayal of not only the physical character, but also the special cultural life, of the Berkeley community. In the future, this book will serve as important documentation of several aspects of Berkeley’s life half a decade to either side of the turn of the century. “People—Berkeley High School athletes and graduates, local park and library patrons, the late ‘Waving Man,’ BART commuters, a City Council public hearing audience, churchgoers, teenagers sitting on the curve of Telegraph—figure vividly into his Berkeley tapestry. “From the upper Russell Street Halloween extravaganza, to the Berkeley Flea Market, to a group of pregnant women exercising in the Downtown YMCA pool, here is Berkeley in all of its quirkiness and special character.